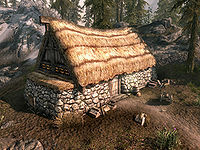 Pinewatch is a cottage and bandits' hideout located northeast of Falkreath and west of Helgen. It rests above a secret underground cave. If you have Hearthfire installed, the location of one of the houses that can be built is a short distance to the north, beyond the pool. It comprises two zones: Pinewatch and Pinewatch Bandit's Sanctuary. 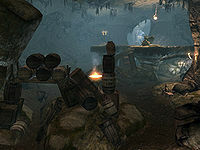 The location can be entered and cleared, and the items for both related quests can be collected prior to starting them. Along the path to the house from the road are two thistles, six purple, three red, and two blue mountain flowers. The cart in front of the cottage contains four leeks and eight potatoes. There is a small pool just to the north, with two mudcrabs, and a nirnroot. There is a tanning rack on the south side, and a wood chopping block and a fenced garden at the rear. The garden contains six leeks, five potato plants and two snowberry bushes. To the right of the door, behind a food barrel and sack is a Danger shadowmark painted on the wall. To the southwest, immediately down the road, is a bandit-controlled bridge, a lookout post where bandits with a lever controlled boulder trap await unwary passersby. The entrance is kept adept-locked at all times. The cottage is occupied by Rhorlak who will turn hostile when you enter, unless you are on the related quest, Silver Lining (see the quest page for details). Everything inside the cottage is marked as owned and taking anything is considered stealing. Upon entering, you are in a single room the full size of the cottage, on your immediate left there is a rack hanging from the ceiling which holds two pheasants and a whole salmon. In the southern corner is a stack of crates over a flight of stairs that lead down to the basement, along the southwest wall. The occupant is usually found downstairs. Opposite the doors, against the northwest wall is a dresser containing clothes, with a couple of common books on top. To the right is a wooden bench and beyond that a small round wooden table with a small mead barrel on top. At the far end of the wall are some barrels and a cupboard holding an iron sword, a Potion of True Shot and three iron arrows. On the floor in front are two sabre cat pelts. 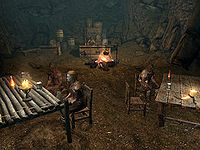 Against the northeast wall is a long wooden table with two bottles of Nord mead, a banded iron shield, a random mace, an iron helmet, a hunting bow, a random sword, a random war axe and two iron arrows on top. Above the table are two garlic braids, a bunch of dried frost mirriam and a bunch of dried elves ear. In the eastern corner are more barrels with a crate on top and beside these is another long wooden table against the southeast wall. On this table are three bottles of Nord mead, two potatoes, a raw rabbit leg, a pheasant breast, a salmon steak, a seared slaughterfish steak, a baked potato, a portion of grilled leeks, and some bread and cheese. Hanging over this table are two more racks holding a total of four rabbits, a pheasant, and a whole salmon. To the right is a set of shelves holding six common books, two hats, a pair of leather bracers, a belted tunic, and two pairs of boots. Beside this is a round table and near the floor, pinned to the wall by an iron dagger a warning note. Descending the stairs to another room of the same size. On your left is a cupboard holding two cabbages, two potatoes, two raw rabbit legs, and four salt piles. To the right is a fireplace with a cooking pot on a hearthstone with a bulb of garlic beside it. On the mantelpiece are three iron daggers, a bowl of troll fat and a bottle of alto wine. To the right of the fireplace is a pile of firewood with a woodcutter's axe leaning against it, and behind that another cupboard which holds only clutter. Hanging over it are three bunches of dried elves ear and two bunches of dried frost mirriam. 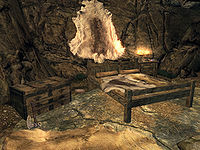 Coming out of the middle of the northeast wall is a single owned bed, and an end table to the left with two bottles of Nord mead on top. To the right is a dresser containing clothes and with a steel mace on top. Under the bed is a pair is random boots. 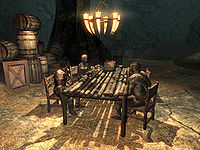 Against the southeast wall is a round wooden table and chairs with a loaf of bread and two more bottles of Nord mead. To the right is an empty set of shelves with a bottle of wine beside it on the floor and two loose septims on the floor in front. 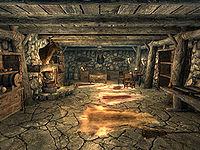 To the right of the shelves is a long wooden table with a Note to Rhorlak, a small coin purse, a random war axe, five loose septims, a quiver of iron arrows and a bear trap on top. On the wall immediately to the left of the table is a push button that swings open the shelves revealing a tunnel behind. There is a bucket containing three bottles of wine immediately behind the shelves, which are a bonus as mentioned in the note to Rhorlak. Most of the bandits below are leveled, and most are within earshot of several others, which can lead to some challenging battles. At the bottom the tunnel opens out into a large chamber with architecture similar to Nordic barrows, with wooden platforms on scaffolding linked by wooden bridges. 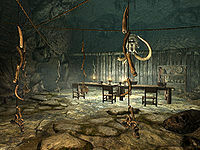 On your immediate right, leaning against the wall is a woodcutter's axe, while on your immediate left is a set of shelves holding a quiver of random arrows, a bear trap, and a copy of the Sneak skill book The Red Kitchen Reader. Further to the west is the corpse of a High Elf, with an iron dagger in their back, in front of another set of shelves holding a random healing potion, a random stamina potion, a hide shield, an iron helmet, and a woodcutter's axe. To the right is a cart containing several cheese wheels and potatoes with a flight of wooden stairs descending to the ground level below. To the right of the tunnel past a wall of wooden planking is a narrow bridge linking to the first platform. On the far side of the first bridge is a bandit standing guard with a second further to the left. Beneath the platforms and bridge is a rubble-choked chamber. On the far side of the first bridge is a crossroads, with a second bridge behind heading north, a door on the right that is barred from the other side (which will be a short-cut back out later), and a bridge crossing to a level-dependent locked door to the west. Behind this door is a small alcove with a set of shelves holding four bottles of alto wine, three bottles of wine, a random potion of health, a random potion of stamina, a random potion of strength, a random poison, and a bottle of frostbite venom. A second bridge leads north and meets up with the first before leading to a gap into another chamber. On your left is another bridge heading west, with another bandit patrolling. Any noise at this point can alert them and cause them to investigate. The chamber ahead contains nothing of interest — it just provides an alternative route down to the ground level in the first chamber. There is a wooden ramp on the left and an earthen ramp on the right that both lead down to the ground. A short tunnel heading southwest leads back beneath the platforms and bridges in the first chamber. Near the southern corner of the chamber is an apprentice-locked chest by a rock pillar with a torch above it, near the front of the chamber and the wooden stairs seen previously from above. There are several carts alongside several cabbages and cheeses strewn across the ground. To the north of the stairs is a trap door with a lever to the right and another at the rear, both of which operate it. 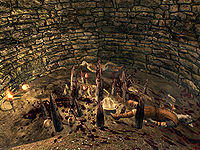 The corpses of two more Khajiit laying on top of the trap door. Under the flight of stairs is a tunnel with a bear trap part way along it. After a couple of turns it descends into a small spike pit, beneath the trap door. Among the stakes are several human bones, the bodies of two dead Khajiit, a small coin purse, a potion of minor healing, and a lit torch. A short distance east of the trap door is a woodcutter's axe stuck in a block of wood and beyond that is another bear trap on the ground. Following the platforms and crossing the bridges to the west leads to a narrow corridor and small empty room with another chamber beyond. It contains a total of three bandits. One of them is usually found working a grindstone, a second patrols the chamber, and the third just stands around. The chamber is filled with stacks of crates, barrels, sacks, and furniture. There is an unlocked chest near the bottom of a ramp to the north of the grindstone. It leads up to a stone walkway running across the chamber. There is an urn at the far end and an oil lantern hanging above a broken urn part way along the walkway. At the rear of the chamber, to the north is part of the walkway separated from the rest. A wooden ramp leads up to a novice-locked chest. Just in front of this is a path that descends to the southeast to a wooden door that leads into Pinewatch Bandit's Sanctuary. Just in front and to the left is one final bandit standing against the wall who can be quite difficult to see. The architecture is still that of typical Nordic barrows. Ahead is a chamber with bone chimes hanging from the ceiling in front. It is possible to avoid these to the left. The chamber beyond is filled with stacks of crates, barrels, furniture, etc. in rows either side of a long wooden table in the center. There are three bandits sitting at the table, one of which is a magic-user who has a preference for shock magic. All three of the bandits carry a copy of Roras's Letter which details a plot to break into the treasure room by Roras, whom the previous warning note has revealed to be dead. On the table are five bottles of Nord mead, four of them in a basket. A path runs behind the stack on the left with a bear trap on the ground at either end. There are four common books on top of a barrel near the front of the chamber. Part way along the stack on the left is a novice-locked chest, just before a rock pillar. On the same side just after the pillar is an expert-locked chest. There is a barrel next to this with a basket on top containing another five bottles of Nord mead. Along the northwest wall is an earthen ramp that starts at the rear of the room and rises towards the front. At the top of the ramp is a short narrow tunnel heading west into another chamber. You can hear a bandit singing or talking to themselves as they patrol the chamber ahead. There are several rock pillars supporting the ceiling and blocking a clear view of the next chamber. There is only the one bandit patrolling this chamber. Between the pillars is a bear trap and against the northern wall are two square cages, both with leveled locks. The left-hand cage can be opened with Pinewatch key, which is carried by Rigel Strong-Arm. However neither cage contain anything of interest. To the southwest is a large arch with wooden beams supporting it. 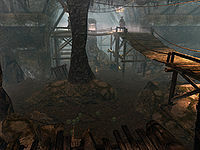 To the right is a pickaxe and just beyond it is the body of a dead bandit and part of a walkway that has fallen from above. At the end of the chamber is a narrow flight of stairs leading up to a wooden door. 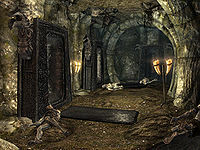 Beyond the door is a chamber guarded a single bandit, but with five upright sarcophagi against the walls, in front of each of these is a dead draugr. To the west is a wooden door and to the east an irregular tunnel. The door has a leveled lock and behind it is a small room containing a novice-locked chest with an adept-locked tension cable that triggers a spear trap from directly behind the chest. There are two small coin purses on the floor. Against the walls are two sets of shelves holding a quiver of random arrows, an empty random soul gem, an unusual gem, a random poison, eight common books, a random light armor cuirass, a pair of random boots, a random potion of healing, and four loose septims. The tunnel to the east turns south and on the ground is another copy of the Warning with another iron dagger. Ahead the tunnel opens into a cave that is being used as a dormitory. Opposite, a bandit is sleeping in a single bed, with four other unowned single beds in the chamber. Any fighting will alert four more leveled bandits who are behind the wooden wall to the left (on top of which there is an elk's head). To the southeast is a long wooden table and a chair, with another copy of Roras's letter on the table. There are two dressers between some of the beds opposite, one of which has a random bow and a steel sword. On the left, against a wooden wall, are two sets of shelves holding three sets of random armor, two random helmets, and three pairs of random boots. To the left of these shelves is yet another copy of the warning stuck to the wall with another iron dagger. Behind the wooden wall is a chamber with a bar set up at the far end and two long wooden tables and chairs at this end. Both tables have a bottle of Nord mead on top. Against the other side of the wooden wall are two more sets of shelves that are empty. In front of the bar is a campfire with two pots hanging over it, one contains two baked potatoes and the other four portions of grilled leeks. Beside the fire is a woodcutter's axe. The counter is in a L-shape, and has a bottle of Nord mead on top, an iron warhammer, three bottles of wine, two random poisons and a sack of food underneath. Behind the counter is a set of shelves holding eight more bottles of Nord mead. Beside this are a stack of barrels. In the middle of the north wall is a short tunnel with yet another warning pinned to the wall by an iron dagger. It leads to another chamber with many bone chimes hanging from ropes strung across the room. two long wooden tables and chairs laid end-to-end. Behind the table is another wooden wall with the skull of a mammoth on top. Care must be taken to avoid the chimes, start to the right, pass the tables on the right and then hug the wooden wall to avoid any noise. Against the east wall is a workbench. On the tables and floor are more copies of the warning, a Father's Missive that expresses a father's concern over his daughter's banditry, and Rigel's letter, which is an explanation to her father of why she has turned to banditry. Against the wooden wall is another set of shelves holding seven common books, six bottles of alto wine, a bottle of wine, a random potion of healing, and a troll skull. In the southwestern corner is a set of shelves holding ten more common books. Behind this wooden wall is Rigil Strong-Arm's sleeping quarters. She is the Bandit Chief, is well armed, and the highest possible level. She carries a copy of Pinewatch Key and Pinewatch treasure room key. Her quarters contain an unowned double bed with an end table to the right. On top of this is a filled random soul gem. To the left is an apprentice-locked chest with a random, possibly enchanted war axe leaning against it. Beside the bed on the floor is a common book and against the back of the wooden wall is a dresser with a Potion of Minor Healing on top. There is a narrow tunnel in the west wall, just in front of the entrance to her sleeping quarters. Along this tunnel are a few loose septims and a small coin purse. 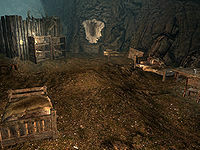 At the end is a wider corridor with a dead draugr laying in front of an upright sarcophagus to the left and to the right is a wooden door with a bone chimes hanging in front. The door has a master-level lock, but is opened with Pinewatch Treasure Room Key. There is a short corridor behind leading to an iron door. This leads out onto the walkway that had partially collapsed with the dead bandit below. The gap is spanned with wooden logs. At this end is a pressure plate that shoots a barrage of poison darts across from either side. At the far end is another wooden door and another corridor; it turns to the south and there is another pressure plate, this one triggers a row of swinging blades ahead. At the other end is yet another pressure plate which triggers a battering ram in the next corridor heading west. A metal pressure plate near the end doesn't appear to trigger anything, and around the corner is another wooden door which has a swinging mace trap behind it. This opens into the treasure room, which is an old catacomb. On a raised section in the middle is a broken sarcophagus with a final pressure plate in front that triggers a spears trap, with many spears that come from different directions. The sarcophagus is filled with treasure, including pieces of ebony, quicksilver, gold, corundum, and silver ore, two silver and two gold ingots, a garnet, an emerald, an amethyst, two small coin purses, many loose septims, a random potion of healing, a random enchanted helmet, two silver candlesticks, and a curious silver mold. There is a dead draugr to the left of the sarcophagus that can also be looted. Beside the chest is an iron door that leads back to Pinewatch, specifically bringing you to the barred door found near the beginning of the cave system. Despite being an enemy location, items in the cottage are owned, while items in Pinewatch Bandit's Sanctuary are not. Directly north are two iron ore veins, and to the northwest is a corundum ore vein. Another corundum vein can be found due south, and another iron vein can be found to the southeast. There are two stone quarriesHF nearby: one by the north side of the cottage, the second north-northeast of the cottage (which is the location of the Lakeview Manor if you haven't bought the land yet). 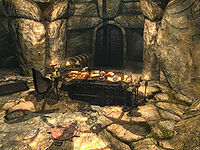 A necromancer's large stone table can be found due north of the cottage (past the area for Lakeview Manor), near the shores of Lake Ilinalta. Upon the table is a leveled weapon and a copy of the Conjuration skill book 2920, Hearth Fire, v9. Rigel respawns with the rest of Pinewatch. The Light Foot perk does not work on the first pressure plate that activates the darts. This page was last modified on 6 April 2019, at 12:04.